The point of the “Albums Revisited” feature is to look back at an album that didn’t fare as well with fans and/or critics. The problem with trying to pick a King Crimson album to feature posed a few problems. One, none of their albums are consistently panned by anyone. You can basically find critics who hate pretty much any of their albums and the fans tend to be fairly supportive. The second problem is that the band has changed drastically over the years, sometimes from one album to the next. Because of this it’s hard to truly compare and make a fair distinction. If said that “Lizard” and “Construction of Light” are both underrated, that statement is true but for wildly different reasons because the bands (other than Fripp) could not be more different. Now that I’ve whined for 2 paragraphs, I can explain why I chose “Islands.” One reason is that it’s one the albums that features a band that only existed for this one album. Add in that Fripp himself fired the entire band, there’s certainly a lack of authenticity to it all. Plus the lineup that followed was one of the band’s classic lineups. So what about the album itself? I would agree that it is one of the weaker albums but for very specific reasons. MOST of the songs on “Islands” are quite good but none are ones who instantly think of when the band’s name is brought up. Add to that singer Boz Burrell (future member of Bad Company) was not the vocalist in the caliber of Lake or Wetton. He was a “rock” guy. You could sense that he never believed anything that he sang. Unless of course, you consider “Ladies of the Road” which worked fine with Boz’s voice. The problem was it was a fairly stupid song, both musically and definitely lyrically. I guess it’s no worse than “Cat Food,” right? Still, songs like “The Letters” and “Islands” are great songs that could have sounded even better. Imagine Wetton singing them. Boz does a decent job though. He’s better than Gordon Haskell! The rest of the band sound amazing. The track “Sailor’s Tale” is proof of that. Mel Collins delivers every time he is called on. The late Ian Wallace was a very underrated drummer. Fripp is Fripp which is always amazing. So really other than one track, “Islands” is a very good but not great album. The potential for greatness was there and I am guessing that Fripp knew the band could do no better than this. So he ended it. Wisely. This entry was posted in jazz, progressive rock and tagged albums revisited. Bookmark the permalink. Ha! “Cat food, cat food, cat food.” Very annoying, but I always have that lyric stuck in my head when those words are uttered. 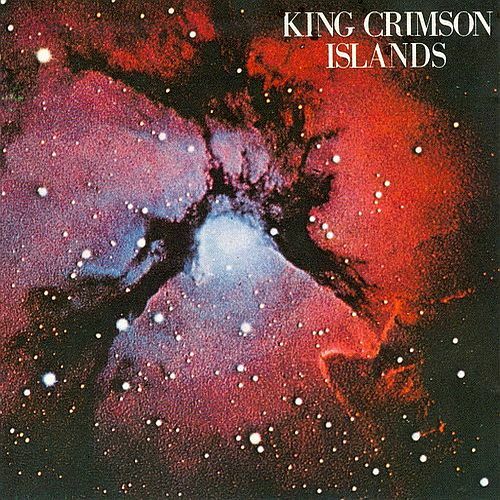 The funny thing is, I just posted a poll in a King Crimson group asking which KC album I should buy next and Islands has more votes than any album but Starless And Bible Black (and only because I said Red was my favorite album). So I’m thinking it’s not really very underrated! Islands is totally cool. No reason to hedge your bets here. It’s fascinating.